You might have heard this a zillion times before. Exercise gets blood pumping throughout your body. But did you know that what we eat can also impact your blood circulation? Your body consists of numerous tiny cells such as nerve cells, brain cells, muscle cells and blood cells etc. These cells perform different functions in different parts of your body. Each cell needs nutrition to get the energy required for performing these functions. It also needs oxygen that combines with the nutrients to convert it into energy. For all this to happen, a good blood circulation is important. If your body suffers from a poor blood circulation, the cells cannot perform properly and soon various diseases and illnesses start surfacing. Eating a balanced, nutrients-rich diet, is one way to ensure an efficient blood supply in your body. A Mediterranean type diet rich in omega-3 fatty acids, whole grains, fresh fruits and vegetables, fish, olive oil is good for a healthy blood circulation. 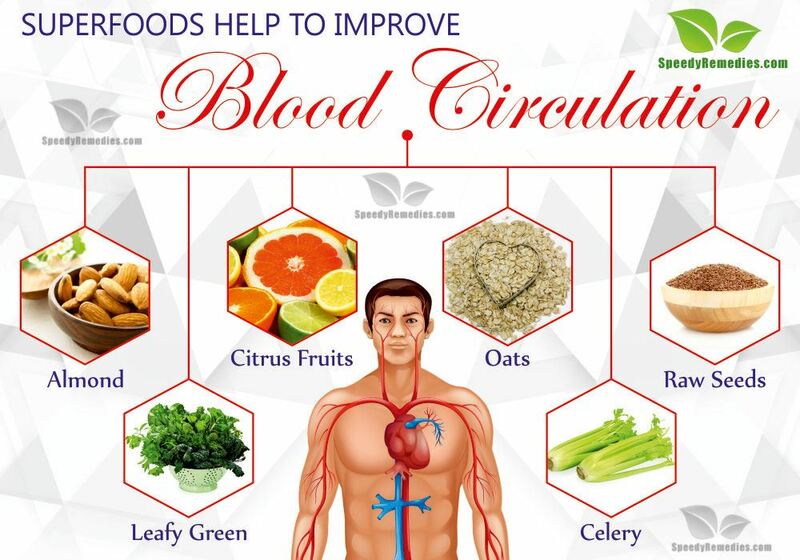 Here are some foods to help improve your blood circulation. Celery contains vitamin K, an important nutrient that is essential for a healthy blood circulation and blood clotting in case of an injury. It contains folate, potassium, fiber and molybdenum and small amounts of vitamin C, vitamin A and some B vitamins. Vitamin A plays a role in ensuring your heart can effectively pump blood throughout your body, while vitamin K is effective in controlling blood thickness which is important for a healthy blood flow. A blood that is very thin can lead to excessive bleeding and this can disrupt normal blood flow to your tissue. The other nutrients in celery help promote a healthy blood flow. Being a natural diuretic, it is also considered an effective natural treatment for high blood pressure. If your blood pressure is running high or you just want to improve your circulation, eat more of this skinny green veggie. It can be added to delicious green juice or smoothie recipes, chopped into salads or soups, or simply enjoyed as a snack with some natural peanut butter. The ribs of celery are crunchy and are often used to make soup or salad. It has a salty taste, so celery juice is a good mix with the sweeter fruit juices. Certain raw seeds support optimal health by providing an array of health benefits like rapid recovery from disease or injury as well as lowered cholesterol and blood pressure levels. Researchers suggest that chia, flax, hemp and pumpkin seeds are full of omega-3 fatty acids, fiber and antioxidants. Fiber reduces bad cholesterol that builds plaque, a hardened mixture of cholesterol, fat and other elements, in the arteries. Plaque makes it harder for the blood to move smoothly through your body, resulting in poor blood circulation. So, in a way fats promote good blood circulation. These seeds also help reduce inflammation, boost the immune system and provide natural blood sugar control. As we have seen above, eating a diet rich in fiber can help reduce cholesterol in the blood, thereby helping maintain a good circulation in your body. Oatmeal contains soluble fiber, that helps lower your bad cholesterol. Soluble fibers reduce the absorption of cholesterol in your bloodstream. This helps in maintaining a smooth flow of blood in your body. The U.S. Department of Health and Human Services recommends eating a diet that contains less than 200 milligrams of cholesterol per day. Foods like oats that are high in soluble fiber can help achieve this goal by limiting the amount of cholesterol absorbed by the body. Oats are considered one of the best natural foods for removing cholesterol. They are anti-inflammatory as well. Since oats also provide energy, they can be used as small meals between workout sessions or on the move. To improve the alkalinity and digestibility of oats, simply soak them overnight. Oranges, lemons, limes and grapefruits are refreshing citrus fruits that contain compounds called flavonoids, which may have anticancer properties. Additionally, due to their antioxidant properties, they can neutralize free radicals and may protect against heart disease. Citrus flavonoids are also helpful in improving blood flow through coronary arteries and preventing the oxidation of bad cholesterol. As folate and thiamine are necessary for cell division and metabolic well-being respectively, you can rely on citrus foods for these nutrients. To sum it up, these fruits are some of the best low-sugar, anti-inflammatory foods you can eat. Phenomenal internal body cleansers, they are also fairly easy to digest in comparison to other higher fructose fruits. Almonds contain protein, fiber, riboflavin, calcium and potassium. A 2005 study published in the Journal of Nutrition showed that almonds when eaten whole, with their brown skin are much more nutritious than their skin steamed off. The study showed that almonds contain 20 antioxidants in their skin. Almonds contain plant-based protein, fiber and monounsaturated fats along with nutrients like vitamin E and magnesium that help to keep your heart healthy. Substituting almonds for saturated fats may help lower your bad cholesterol levels thereby improving your blood circulation. Almonds with their combination of protein, fiber, and good fats can make for a satisfying snack choice that can help you from reaching out for those unhealthy food choices between meals. This in turn will help prevent weight gain, states a 2007 study published in The Journal Obesity. Different forms of almonds such as almond milk, almond butter, and almond powder are excellent additions for those choosing a gluten-free lifestyle. So, eating just a handful of raw almonds on a routine basis will naturally promote healthy circulation by supporting weight loss and build up of lean muscle mass. Enjoy raw almond or simply sprinkle some of the nuts over porridge. Nothing can be as good as this healthy snack. Green leafy vegetables are rich in nitrate that may thin the blood and help oxygen circulate around the body more efficiently, according to a study published in Federation of American Societies for Experimental Biology Journal. The study showed that how nitrate-rich vegetables can help produce erythropoiesis, a hormone that determines red blood counts. This hormone impacts your body’s capacity to circulate oxygen throughout your body and thereby ensure a good circulation. No matter what you choose, from nitrate-rich spinach to vitamin-rich kale, there are umpteen greens that can purify the blood as well. Dense sources of chlorophyll, greens like mustard, turnips, arugula, romaine and lettuce can be enjoyed as salads, in smoothies or soups, or as raw wraps. The vitamin K present in cucumbers is known to be essential in the reducing the risk of blood-clotting process. Cucumber with their higher level of water, potassium and fiber benefits your blood flow. Cucumbers contain several antioxidants, vitamin C, beta-carotene and manganese. It also has in it flavonoids, triterpenes and lignans that have anti-inflammatory properties. Cucumber is rich in vitamin C that is good for your immune system. From preventing acidity to keeping skin well-toned, eating cucumbers regularly can benefit you in a number of ways. Due to their high alkaline levels, cucumbers can also help regulate the body’s blood pH and neutralize acidity. They may also regulate blood pressure and help in proper structuring of connective tissues in the muscles, bones, ligaments, cartilage and tendons. Avocados are rich in Omega-3 fats that help in maintaining a good blood circulation. According to a 2015 study published in the Journal of the American Heart Association, incorporating an avocado daily to your healthy diet will help you lower the bad cholesterol levels among overweight and obese people. Reducing the bad cholesterol level will aid in ensuring a good blood flow throughout your body. The study suggested substituting polyunsaturated and monounsaturated fatty acids instead of saturated fats. Avocados are another source of monounsaturated fatty acids, but they also have several other beneficial components, such as vitamins, minerals and fiber. In addition to all these high-antioxidant foods, you can also try carrots, avocados, tomatoes, squash and root vegetables. Play close attention to certain fruits, vegetables, whole grains and healthy fats when looking out for the right food to improve your blood flow. These natural wonders are going to serve your body well without burdening your pocket. Of course, never forget to drink plenty of water and embrace gentle forms of exercise!